The LVCN4000 Series Conductive Level Switch Controllers offer a wide range of customized options to meet any application’s need. LVCN4000 Series are designed to control the level of all conductive mediums with up to 2 different points of level control. The LVCN4100 Series has one single rod and is able to control one point of level. 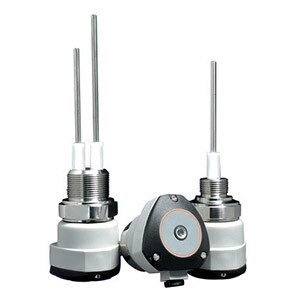 The LVCN4200 Series can accommodate up to two rods and is able to control two points of levels. Both models feature a 24 Vdc-power supply and internal relay that replaces the need for an external relay. As with all other conductive probes, the rods for these two models can be custom cut and made with any process connection, such as threaded or sanitary. In addition, the electrodes operate with alternate current to prevent electrolyses. Custom models* are available, see Part Number Builder (below) for the most common configurations. Consult Omega Flow Engineering for a quote on over custom versions. * Rods must be coated when using the probes above 82°C (180°F). All conductive applications must have a reference point, such as a metallic tank wall or another rod for non-metallic tanks.